I usually write blog articles about the market or the quantitative aspects of analysing them including Python. As a bit of an experiment, I ran a Twitter poll, asking whether I should try something a bit different for a blog post, should I write my next blog post about burgers? Somewhat to my surprise, a majority of voters agreed, so in the spirit of democracy, here’s my article about the best burger joints in London and New York (or at least the ones I like!). Hopefully, if you’re a local or on a business trip to either of these cities and hungry, it’ll also give you a few ideas too! should I write a blog post on my favourite burger places in NYC and London? Ten years ago, if you were to ask most people of a burger place in London, most likely they would have responded with a fast food restaurant such as McDonald’s or Burger King. However, in recent years, many upscale burger joints have proliferated through the city, perhaps in part driven by the financial crisis. The two most well known upscale burger chains are Byron and Gourmet Burger Kitchen. However, the focus of this article is on the more quirky and smaller burger joints. One of my favourites is MEATliquor on Welbeck Street, just by the bustle of Oxford Street. The restaurant itself is a bit confusing. The windows are dimmed, and the lighting is doesn’t help much, alongside what I would term questionable artwork. However, despite trying to lull its diners into a deep comatose sleep through light deprivation, the food is outstanding. The beef burgers are brilliant, with a (un)healthy amount of grease, which some might find a bit too much. I’d also recommend the Dirty Chicken Cheeseburger, a southern deep fried chicken extravagance. So in short, the place looks somewhat questionable, but the food is definitely worth it. There are also several other outposts of MEATliquor around London, which serve up similar delicacies. Nearby, are Patty & Bun and Tommi’s Burger Joint, which I both like, although MEATliquor just pips it for me. One of the most famous burger chains in London is Burger & Lobster, which originally started as an offshoot of the steak house Goodman. For 20 pounds you get the choice between a burger, a lobster roll or a lobster, all served with fries and salad. By whichever metric you choose, 20 pounds is a hefty amount for a burger, especially when you compare it with a lobster at the same price. I have to admit though the burger is somewhat better than the lobster roll they serve up and I’ve always enjoyed the burgers there. It’s also a buzzing restaurant, and somewhere you could even take your clients to (the same could not be said of MEATliquor). The burger is at Goodman is similar (and cheaper), but has the added advantage of being accompanied by triple cooked fries, plus you also have the benefit of better desserts. Hawksmoor too, Goodman’s arch steakhouse rival, boasts a burger on the menu (and the desserts are even better than Goodman!). 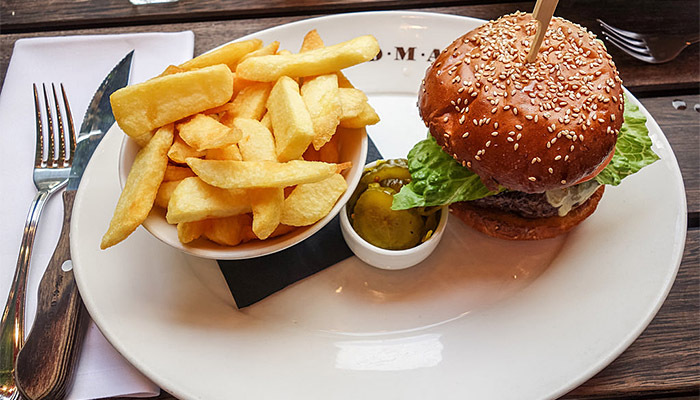 There are numerous other great burger joints in London, which are perhaps less well known. One of these is the somewhat amusingly named Mother Flipper, which is open on Saturday’s at Brockley Market in Lewisham. There’s also a plethora of burger joints in Shoreditch, ranging from Dirty Burger to Red Dog Saloon, home of the impossibly large Devastator burger – a burger I reckon everyone should try at least once in their lifetime (although their arteries might have a bit of an argument with me on this). New York, meanwhile, has always been more of a “burger” city than London. Interestingly, Burger & Lobster has also recently opened up in New York, the prices are a bit cheaper than London making it better value. Of all the burgers I’ve tried in New York, the best was at Minetta Tavern, tucked away in Greenwich Village, which boasts a Michelin star. The star attraction is the Black Label burger weighing in at a hefty 26 USD, made from prime beef cuts. Absolutely brilliant. However, be warned, it is difficult to get a table there, so be sure to make a reservation in advance! I’ve never tried the lunchtime burger at Peter Luger in Brooklyn, but hope to one day, I wonder how it’ll compare with Minetta Tavern? I’d also recommend the burger at The Waverly, which recently opened. By contrast PJ Clarke’s (Third Avenue branch) meanwhile has been open for over century, and has a great selection of burgers. As an aside the lobster roll is pretty good there too! However, New York isn’t all about expensive burgers at steakhouses. JG Melon on the Upper East Side (they’ve also opened up a new branch around Greenwich village) also do a decent burger. Black Tap in Tribeca has attracted a massive following. I was lucky enough to go there when it just opened and very much enjoyed my burger. Last time I went the queue was around the block. Burger Joint in the Parker Meridien always has massive queues and is one of the most well known in New York. It’s a fun place to go, but for me I’ve never thought the burger was that special, just seemed a bit insignificant (I’m sure many will disagree with me on this). There’s also the Five Guys and Shake Shack chains all around New York, which offer good value burgers (when transplanted to London, the value point is somewhat diminished). In general, I would say with New York, there’s usually a good burger around the block, it’s just a case of knowing which block! I don’t claim that the above is a thorough tour into all the burgers you can try in London or New York, but hopefully it’ll prove useful. For the eagle eyed among you, the title of this article is from a Monty Python sketch, so perhaps I was writing about Python after all! Next week, normal service will be resumed on my blog.